Ghanaian Minister of Transport Alhaji Collins Dauda last week presided over the inauguration of Ghana’s newly built four million dollar airport. 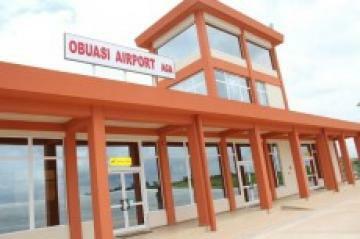 The airport – built at Obuasi – is the second largest airport in the country. Commissioned by Johannesburg Stock Exchange (JSE) listed mining company AngloGold Ashanti (which is also listed on the Ghana Stock Exchange), the new airport promises to boost the region’s economy while improving transport infrastructure in the area. The airport boasts a two-kilometre runway, a new terminal building with arrival and departure halls, a control tower, a fire service, and all the latest meteorological and aerodrome equipment necessary for high security and safety. At the opening ceremony Mr Frederik Attakumah, AngloGold Ashanti Vice President for Sustainability, explained that the decision to build the new airport was linked to the company’s current intense investment push aiming to transform its operations in the area; where the company operates the Obuasi mine. He explained that the new infrastructure would not only enable more business dealings to come to the region, but that it would assist the company in achieving production of more high-quality ounces. Meeting such targets would mean improving commitments to stakeholders and shareholders. However, the building of the new airport also had a distinct community-oriented element, with Attakumah adding: “AngloGold Ashanti’s track record clearly reflects our belief that our success and future is inextricably linked to the success of the communities within which we operate”. In this vein, he also announced that the company will be launching numerous community trust funds in the near future to assist those living in the local region. Minister of Transport Alhaji Dauda commended AngloGold for its endeavour, promising that the investment opened a new phase of socio-economic development for the region but also of the country at large. In order for both business and tourism prospects to increase, the Minister stated: “it is vital that airport infrastructures grow in anticipation of the escalating needs of the air transport industry, as this is a capital – intensive sector”.